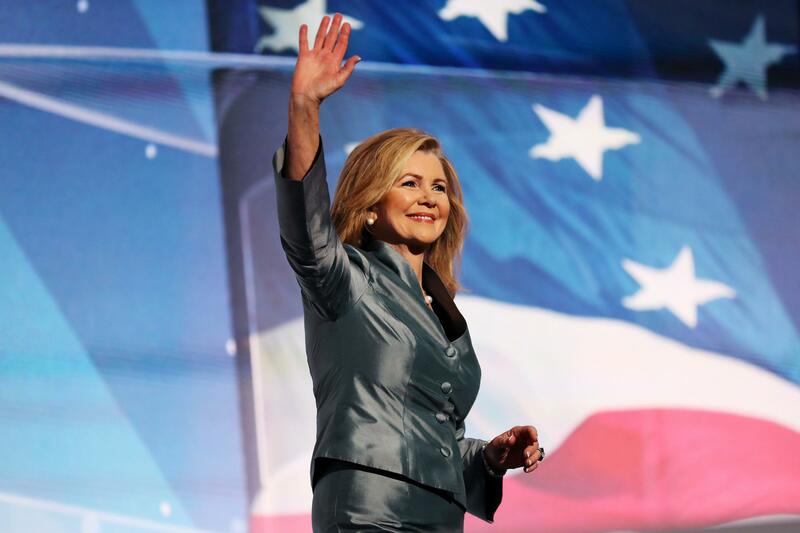 Rep. Marsha Blackburn gave a speech during the Republican National Convention in 2016. Blackburn is running against former Democratic Gov. Phil Bredesen in one of the year's most critical and competitive Senate races. Rep. Diane Black is running for governor of Tennessee, which is one of only seven states that has never had a female senator or governor. Campaign swag for Tennessee Reps. Diane Black and Marsha Blackburn is on display at the Shelby County Republican Party headquarters. A win by either woman this fall would be historic for Tennessee, which is one of only seven states that's never had a female senator or governor. But as both women crisscross the state, their gender rarely comes up with voters — and unlike many female Democratic candidates, it's definitely not something they're emphasizing. "When I'm talking with Tennesseans, I say I'm the most well-qualified person for this position," Blackburn told NPR after a campaign event earlier this month at a bank in Portland, Tenn.
Later that day, at a truck stop near Greeneville, Black relayed the same sentiment. "People talk about that more than I do. I rarely talk about it," Black said about any potentially groundbreaking win. But both women have broken gender barriers. During college, Blackburn became one of the first female saleswomen for Southwestern Company, a door-to-door book company that attracted many conservatives. She was rejected when she first applied because she was a woman, but the company finally hired her, though with a catch — she had to live at home in Mississippi with her parents, while the male salesmen were allowed to travel between cities. Blackburn married and moved to Tennessee, where she would rise through local and state politics. Then in 2002, she became the first woman elected to Congress in Tennessee who hadn't followed her husband in the position. She jumped in the Senate race last year after Sen. Bob Corker announced his retirement. But when Corker was urged by some to reconsider that move amid concerns the more conservative Blackburn would jeopardize the GOP's hold on the seat, a spokeswoman for Blackburn forcefully pushed back that, "Anyone who thinks Marsha Blackburn can't win a general election is just a plain sexist pig." Black grew up in public housing and was a single mother who worked the night shift as a nurse. She later remarried and with her husband founded a multimillion dollar drug testing company. Black eventually ran for the state legislature and then Congress, which led to her own historic milestones. "I was the first female caucus chairman here in the state Senate. I'm the first female to have served as a budget chair for our country. But that's not when I'm running as. I'm running on my credentials," Black recalled. "And I would be very proud to be the first female. I think it does say to young women that females can serve in higher office and serve in leadership positions, and so I'm proud about that part of it. But I don't run my campaign as a female. I run my campaign as a qualified candidate." Both women have taken that approach in Washington. Blackburn has famously said she prefers to go by congressman instead of congresswoman because she thinks it's more gender neutral, and Black has adopted that same title. Back in Tennessee, female political observers say it's past time for the state to elect a woman to its top positions. After all, nearly a century ago, it was Tennessee that gave women nationally the right to vote, as the final state needed to ratify the 19th Amendment. "It's about time, wouldn't you say?" laughs Barbara Trautman, president of the Tennessee Federation of Republican Women. 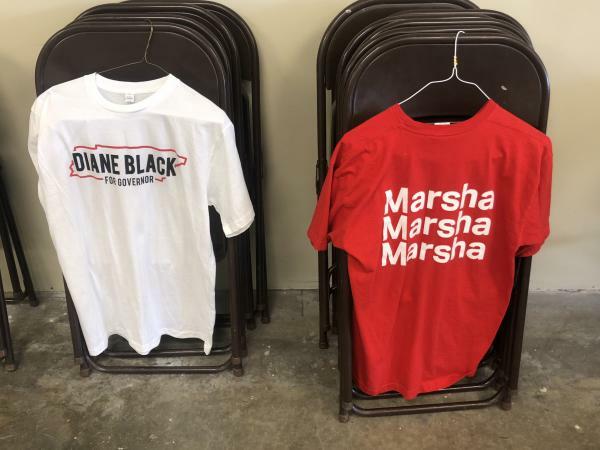 She's sitting in the headquarters of the Shelby County Republican Party, surrounded by campaign signs and several volunteers, many of whom are wearing red "Marsha, Marsha, Marsha" shirts from Blackburn's campaign. Trautman has to remain neutral until after the primary, but if Blackburn, who faces only nominal opposition, and Black in her much more competitive contest, advance, Trautman says it would be a good thing for the party and could help other women win at the local level across the board. "It's part of the paving the way for the younger generation to want to achieve that too," Trautman said. There have been other women who've achieved firsts statewide. In 2011, Republican Beth Harwell became the first female speaker of the Tennessee House of Representatives. Harwell is also running for governor, but in most polling she has lagged far behind Black and the other two frontrunners, businessmen Bill Lee and Randy Boyd. In 1980, Democrat Jane Eskind became the first woman ever elected to office statewide, winning a seat on Tennessee's Public Service Commission, though that's no longer an elected board. Now, governor and senator are Tennessee's only statewide elected offices. Eskind was also the first woman to be nominated by a major party statewide in 1978, unsuccessfully challenging Republican Sen. Howard Baker for his seat. Back then, she faced a lot of pushback because of her gender. "During the campaigns, there were many people who thought that I should go home and have a baby, as improbable as it was at the time," the late Eskind recalled in a video for the Tennessee Women's Hall of Fame. In 1982, Susan Richardson Williams became the first female chairman of the Tennessee Republican Party. She said times have changed since she was party chair — for the better for women. "I think the stigma of being a woman running for office is fortunately gone. I've heard some discussion about Republicans having two women running statewide and whether we've arrived enough to elect two women statewide, and I actually do," Williams said. "I think we're to the point in the South, in and around the country, where gender doesn't matter so much. Yes, it will be historic. But both of those women are qualified to serve in the offices that they seek." National conservatives look to Tennessee in "year of the woman"
Nationally, a win by either Blackburn or Black would be important for conservative causes, according to Susan B. Anthony List President Marjorie Dannenfelser. Her group promotes anti-abortion rights candidates and has endorsed both women in their races. "Tennessee stands out as a place that is really answering the call for women to run, and especially in the uniquely important way that these two women are very strongly pro-life women running for the highest level offices that Tennessee or any state can can offer," said Dannenfelser. She said it's important for more conservative women to run, but the difference is that Republicans don't talk about their gender in the same way Democrats do. "I think that the Democrats are far more invested in identity politics — so, 'Vote for me because of how I look and what my gender is.' I think that those reasons are legitimate as a supporting role, but not as the only reason, and so that is different," said Dannenfelser. "This is a moment where the experience of women needs to be heard," Dannenfelser added about conservative women, especially in the wake of the #MeToo movement, "To put an R beside their name or a D or an I or whatever ... and exclude any women in this conversation, really does not serve women." Blackburn's race could well be pivotal to Senate control this fall, and polling has shown she's neck-and-neck with Bredesen. In that contest, despite being a woman, she could struggle to keep women voters. A Mason-Dixon poll from April, which gave Bredesen a three-point lead overall, found that he wins women voters by 11 points. Both Black and Blackburn have heavily underscored their support of President Trump in their races, and while the president's approval ratings have fallen — especially among women — nationwide, they're banking that he can still help them in a state he carried by 26 points, even if Trump has a history of controversial comments about women and has fought off allegations of sexual misconduct. "Women know that their economic security, their national security is in better shape" because of President Trump "and they are grateful for that — and that is primarily what they're talking about right now," Blackburn countered after her Portland event. Democratic women are winning primaries this year at record numbers. In the next Congress, the number of Republican women could drop, but in Tennessee, two GOP candidates stand out as they try to make history as the first women ever to serve as senator or governor in that state. As NPR's Jessica Taylor reports, neither is really emphasizing that possibility, though. JESSICA TAYLOR, BYLINE: Representative Marsha Blackburn is at a bank in Portland, Tenn., making her pitch for why voters should pick her in this fall's tough Senate race against former Democratic governor Phil Bredesen. MARSHA BLACKBURN: People will say, Marsha, you're a wife; you're a mother, a businesswomen, and you've been in public service; why in the world do you want to go to the U.S. Senate? That place is totally dysfunctional. TAYLOR: Blackburn's answer is that she wants to be part of fixing the problem, but she's quick to emphasize her resume over her gender. In fact, that's why she famously prefers to go by congressman instead of congresswoman. She says it's more gender-neutral. BLACKBURN: When I'm talking with Tennesseans, I say, I'm the most well-qualified person for this position. TAYLOR: Her colleague in Congress, Diane Black, is taking the same approach in her campaign for governor. TAYLOR: She's in a truck stop in Greeneville, Tenn., where a new flagpole is being dedicated. Black first has to win a crowded primary next week, and that's no sure thing. 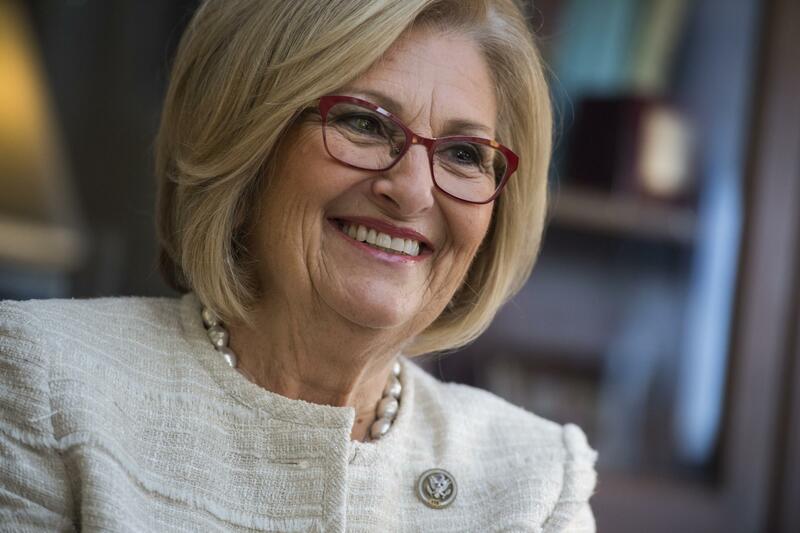 DIANE BLACK: No, people talk about that more than I do. I rarely talk about it. TAYLOR: Like Blackburn, she thinks it's more important to talk about her loyalty to President Trump than whether she can make history in November. Both women have already had trailblazing careers. Black grew up in public housing and was a single mother who worked the night shift as a nurse. She later remarried and with her husband founded a multimillion dollar drug-testing company. Black eventually ran for the state Legislature and then Congress, which led to historic milestones. BLACK: It was the first female caucus chairman here in the state Senate, the first female to have served as the budget chair for our country. But that's not what I'm running as. I'm running on my credentials. TAYLOR: Blackburn took a similar path, and in 2002, she became the first woman elected to Congress in Tennessee who hadn't followed her husband in the position. Nearly a century ago, Tennessee gave women nationally the right to vote as the deciding state to ratify the 19th Amendment. But since then, Tennessee has lagged behind. Now it's one of only seven states that's never had a female governor or senator. Susan Richardson Williams was the first female chairman of the Tennessee Republican Party. She says that while other women running for office have faced pushback because of their gender in the past, she doesn't think either Black or Blackburn will this cycle. SUSAN RICHARDSON WILLIAMS: I think we're to the point in the South and around the country where gender doesn't matter so much. Yes, it'll be historic, but both of those women were qualified to serve in the offices. TAYLOR: But nationally, a win by either Black or Blackburn would be important for conservative causes, according to Marjorie Dannenfelser, president of Susan B. Anthony List. MARJORIE DANNENFELSER: Tennessee stands out as a place that is really answering the call for women to run. TAYLOR: Dannenfelser's group promotes anti-abortion-rights women candidates and has endorsed Black and Blackburn. She says it's important for more conservative women to run. The difference is, the Republicans don't talk about their gender in the same way Democrats do. DANNENFELSER: Yes, I think that Democrats are far more invested in identity politics - so vote for me because of how I look and what my gender is. TAYLOR: But Marsha Blackburn says she still understands the significance of her candidacy. BLACKBURN: I don't talk a lot about it in the race, but when I win this race, it will be a history-making win. TAYLOR: And in a year when women are generating lots of enthusiasm for the Democratic Party, Tennessee could be Republicans' answer. Jessica Taylor, NPR News. (SOUNDBITE OF EVIL NEEDLE SONG, "LUCKY LADY") Transcript provided by NPR, Copyright NPR.